Lehman Brothers Holdings Inc. was one of the financial institutions involved in the U.S. financial crisis and bank bailout. Lehman provided financial services to corporations, governments, institutions, and wealthy individuals worldwide. It was based in New York City with regional headquarters in London and Tokyo. Lehman Brothers Holdings Inc. declared bankruptcy September 15, 2008. The filing marked the largest bankruptcy in U.S. history with $613 billion dollars of debt. Prior to its collapse, Lehman Brothers was the fourth largest and the oldest of the five major global financial-services firms. Their services included investment banking, equity and fixed-income sales, research and trading, investment management, private equity, and private banking. It was a primary dealer in the U.S. Treasury securities market. Its main subsidiaries included Lehman Brothers Inc., Neuberger Berman Inc., Aurora Loan Services, Inc., SIB Mortgage Corporation, Lehman Brothers Bank, FSB, Eagle Energy Partners, and the Crossroads Group. The firm's worldwide headquarters were in New York City, with regional headquarters in London and Tokyo, as well as offices located throughout the world. Immediately following the bankruptcy filing, an already distressed financial market began a period of extreme volatility, during which the Dow experienced its largest one day point loss, largest intra-day range (more than 1,000 points) and largest daily point gain. What followed was what many have called the “perfect storm” of economic distress factors and eventually a $700 billion bailout package (Troubled Asset Relief Program) prepared by Henry Paulson, Secretary of the Treasury, and approved by Congress. During the housing bubble home prices rose a staggering 96 nominal percent price increase over six years (72 percent in real dollars. Prices peaked in May 2006 and started a slow decline. Much of this boom was funded with mortgages, including subprime mortgages, of questionable quality that were financialized, aggregated into complicated financial instruments like collateralized debt obligations (CDOs) and sold as high-rated securities. The risk of these securities were supposedly balanced by the purchase of Credit Default Swaps (CDS) from companies like AIG. However, many companies took unbalanced positions in these securities and derivatives, believing that housing prices could not fall. In addition to engaging in risky derivativee trading including CDSs, Lehman Brothers experienced unprecedented losses in the mortgage crisis. Lehman held on to large positions in subprime and other lower-rated mortgage tranches while securitizing the underlying mortgages leading to huge losses accrued in lower-rated mortgage-backed securities throughout 2008. In the second fiscal quarter, Lehman reported losses of $2.8 billion and was forced to sell off $6 billion in assets. In the first half of 2008 alone, Lehman stock lost 73% of its value as the credit market continued to tighten. In August 2008, Lehman reported that it intended to release 6% of its work force, 1,500 people, just ahead of its third-quarter-reporting deadline in September. The bankruptcy of Lehman Brothers, without a rescue from the government, created fear that the government would allow the financial sector to collapse. The stock market fell dramatically the next day. “First, our financial system has become dangerous on a gigantic scale. We knew that the banks were playing games — e.g., with their so-called off-balance sheet activities — but we previously had no idea that these huge corporations were so badly run or so close to potential collapse. Second, we also learned the hard way — after many revelations — that pervasive mismanagement in our financial system was not a series of random accidents. Rather it was the result of perverse incentives — bank executives felt competitive pressure to behave as they did and they were well-compensated on the basis of short-term performance. No one in the financial sector worries too much, if at all, about risks they create for society as a whole, despite the fact that these now prove to be enormous (i.e., jobs lost, incomes lowered and fiscal subsidies provided). Third, weak government regulation undoubtedly made financial mismanagement possible. But poorly designed regulations and weak enforcement of even the sensible rules were in turn not a “mistake.” Rather they were the outcome of a political process through which regulators — and their superiors in the legislative and executive branches — were captured intellectually by the financial system. People with power really believed that what was good for Wall Street was great for the country. "It's unconscionable what they did – or more accurately what they didn't do. They didn't do their homework. People were talking about the failure of Lehman Brothers from the moment of the failure of Bear Stearns in March, or before, and they didn't do a thing. If they knew there was systemic risk, why didn't they do anything about it?" Just before the collapse of Lehman Brothers, executives at Neuberger Berman sent e-mail memos suggesting, among other things, that the Lehman Brothers' top people forgo multi-million dollar bonuses to "send a strong message to both employees and investors that management is not shirking accountability for recent performance." Lehman Brothers was leveraged at 44-1 in 2007 when housing prices started to collapse. "In 2004, the Securities and Exchange Commission relaxed a rule limiting the amount of leverage that Lehman and other investment banks could use. As this Lehman chart shows, that proved to be a temptation the firm could not resist. At first, Lehman’s bets paid out. As Mr. Fuld’s testimony recounts, Lehman achieved “four consecutive years of record-breaking financial results” between 2004 and 2007. These were lucrative years for Lehman’s executives and Mr. Fuld. 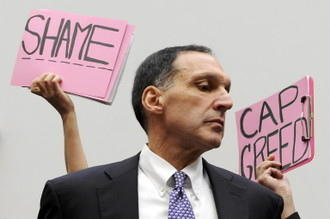 Lehman paid out over $16 billion in bonuses. Mr. Fuld himself received over $30 million in cash bonuses. His total compensation during these four years exceeded $260 million. But while Mr. Fuld and other Lehman executives were getting rich, they were steering Lehman Brothers and our economy towards a precipice. Leverage is a dangerous double-edged sword. When it works — as it did from 2004 to 2007 — it magnifies investment gains. But when asset values decline — as the subprime market did — leverage rapidly consumes a company’s capital and jeopardizes its survival. Mr. Fuld’s actions during this crisis were questionable. In a January 2008 presentation, he and the Lehman board were warned that the company’s “liquidity can disappear quite fast.” Yet despite this warning, Mr. Fuld depleted Lehman’s capital reserves by over $10 billion through year-end bonuses, stock buybacks, and dividend payments.
. . . Risk-taking has an important role in our economy. But federal regulators are supposed to ensure that these risks don’t become so large they can imperil our entire economy. They failed miserably. The regulators had a blind faith in the market and a belief that what was good for Mr. Fuld and other executives on Wall Street was good for America. We are now all paying a terrible price." On Saturday September 13, 2008, Timothy F. Geithner, called a meeting on the future of Lehman, which included the possibility of an emergency liquidation of its assets. Lehman reported that it had been in talks with Bank of America and Barclays for the company's possible sale. However, both Barclays and Bank of America ultimately declined to purchase the entire company. At its New York headquarters, shortly before 1 a.m. Lehman Brothers Holdings announced it would file for Chapter 11 bankruptcy protection citing bank debt of $613 billion, $155 billion in bond debt, and assets worth $639 billion. It further announced that its subsidiaries would continue to operate as normal. A group of Wall Street firms agreed to provide capital and financial assistance for the bank's orderly liquidation and the Federal Reserve, in turn, agreed to a swap of lower-quality assets in exchange for loans and other assistance from the government. The morning of Monday, September 15 witnessed scenes of Lehman employees removing files, items with the company logo, and other belongings from the world headquarters at 745 Seventh Avenue. The spectacle continued throughout the day and into the following day. Stephen M. Lessing, former Managing Director and now Head of Client Relationship Management at Lehman Brothers, is a Bush Ranger having raised at least $200,000 for Bush in the 2004 presidential election. Lehman Brothers gave $130,680 to federal candidates in the 2006 election through its political action committee - 38% to Democrats, 57% to Republicans, and 5% to other parties. The company spent $920,000 for lobbying in 2006. In-house lobbyists were used along with the lobbying firms American Continental Group, O'Neill, Athy & Casey, and DLA Piper. On September 22, 2008, Nomura Holdings announced that it had agreed to acquire Lehman Brothers' franchise in the Asia Pacific region, including Japan, Hong Kong and Australia. The following day, Nomura announced its intention to acquire Lehman Brothers' investment banking and equities businesses in Europe and the Middle East. The deal became effective on Monday, 13 October. In 2007, non-U.S. subsidiaries of Lehman Brothers were responsible for over 50% of global revenue produced. In October 2008 Japanese financial services company Nomura Holdings stepped in and acquired three Mumbai, India based divisions of Lehman Brothers that provided back office and IT operations. Nomura also acquired the Asia Pacific division of Lehman Brothers as the US banking giant was carved up by rivals. Lehman Brothers' Investment Management business, including Neuberger Berman, was sold to its management on December 3, 2008. Creditors of Lehman Brothers Holdings Inc. retain a 49% common equity interest in the firm, now known as Neuberger Investment Management. ↑ "Lehman folds with record $613 billion debt", Marketwatch. 09-15-2005. Retrieved 09-10-2009. ↑ “Approximately $1.2 trillion in market value is gone after the House rejects the $700 billion bank bailout plan.”, CNNMoney.com. 09-29-2008. Retrieved 09-10-2009. ↑ 3.0 3.1 3.2 "Struggling Lehman Plans to Lay Off 1,500", NY Times. 08-28-2008. Retrieved 09-10-2009. ↑ “What We’ve Learned: Ugly Truths About Housing”, NY Times. 09-08-2009. Retrieved 09-10-2009. ↑ "What We’ve Learned: The Beast Still Lives”, NY Times. 09-10-2009. Retrieved 09-10-2009. ↑ “Crash of a titan: The inside story of the fall of Lehman Brothers”, The Independent. 09-07-2009. Retrieved 09-10-2009. ↑ “Death and Near-Death Experiences on Wall St.”, NY Times. 08-28-2008. Retrieved 09-10-2009. ↑ “Explaining the decision to let Lehman fail”, New Yorker Magazine. 01-22-09. Retrieved 09-10-2009. ↑ 9.0 9.1 9.2 “Committee Holds Hearing on Causes and Effects of the Lehman Brothers Bankruptcy”, 10-06-2008. Retrieved 09-10-2009. ↑ “Oversight Hearing on Causes and Effects of the Lehman Brothers Bankruptcy”, The Gavel. 10-06-2008. Retrieved 09-10-2009. ↑ “U.S. Gives Banks Urgent Warning to Solve Crisis”, 09-12-2008. Retrieved 09-10-2009. ↑ "Lehman Heads Toward Brink as Barclays Ends Talks", NY Times. 09-15-2008. Retrieved 09-10-2009. ↑ “10 most memorable events of 2008”, Ecommerce Journal. 12-30-2008. Retrieved 09-10-2009. ↑ “Lehman Brothers: What You Need to Know”, TheStreet.com. 09-15-2008. Retrieved 09-10-2009. ↑ 20.0 20.1 20.2 20.3 20.4 "Sold Out: How Wall Street and Washington Betrayed America", accessed October 2009. ↑ Bush Ranger Stephen M. Lessing, Texans for Public Justice, accessed August 2007. ↑ Lehman Brothers lobbying expenses, Open Secrets, accessed October 2007. ↑ "Lehman Brothers, one year on”, IDG News Service. Retrieved 09-10-2009. ↑ "Nomura to close acquisition of Lehman Brothers' Europe and Middle East investment banking and equities businesses on October 13", 10-06-2008. Retrieved 09-09-2009. ↑ "Lehman Brothers 2007 Annual Report", Lehman Brothers Wikipedia. Retrieved 09-08-2009. ↑ “Lehman Brothers, one year on”, IDG News Service. Retrieved 09-10-2009. ↑ “Managers Win Auction for a Part of Lehman”, 12-03-2008. Retrieved 09-10-2009. Birmingham, Stephen. Our Crowd - The Great Jewish Families of New York. Harper and Row, 1967. C. Bryson Hull and Andrew Quinn, "Enron Suit Targets Wall St. Firms", Reuters/CorpWatch, April 8, 2002. Eric Dash, "C.E.O. Pay Keeps Rising", The New York Times/CorpWatch, April 9, 2006. This page was last edited on 26 July 2017, at 16:56.